Here’s my idea of a low cost and tasty working lunch which can be sourced from all good High streets (even Croydon); perfect for when you can’t be arsed to cook in the evening! 4 spicy chicken wings from the rotisserie in Waitrose for £1.25. A portion of McDonald’s fries 99p. Reduced cheesy coleslaw from waitrose, £1.49. In fact, the chicken is THAT good, I bought 8 wings instead of 4! What?? I’m a growing lad! All in all, less than a sandwich and a coffee from Pret-entious A Manger. 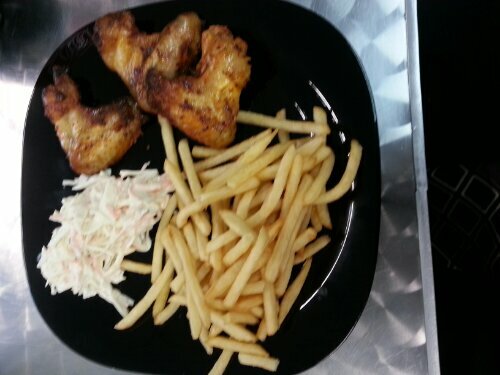 This entry was posted in Food and tagged Chicken, coleslaw, mcdonalds fries, Pret-entious a manger, rotisserie, Waitrose on November 5, 2013 by Kevin.